In February, 61 people who operate in the forestry industry were asked whether they see a more prosperous or a more challenging 12 months ahead. These individuals represent a fairly large component of the forestry sector. 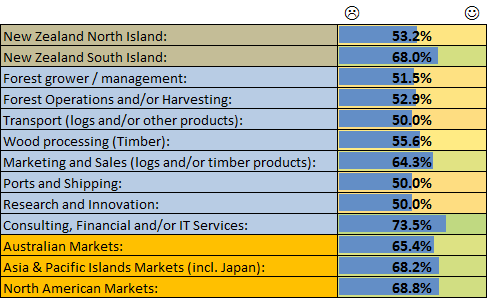 It was noted that North Island based businesses were less optimistic compared to the South Island. Consulting and other support services foresee improved business opportunities over the next 12 months. Transport, Shipping and Ports were generally lower and may start feeling the impacts of higher fuel price outlooks. Higher future interest rates have also become a new norm among recent outlooks. Scion would like to repeat (and hopefully expand) this outlook in May. If you operate a business anywhere along the forestry products supply chain then please consider casting your vote. All information is treated as confidential and results are reported anonymously and at an aggregated scale only. The Outlook will be shared exclusively with participants in June and will only become available publicly in July.